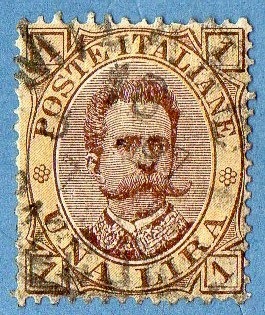 first thing we have to see is that two types of cancellations are visible : one with points or lines and numerals and others , with the more recent circular 'look'... (this distinction help us to know what are the stamps from the earlier printings..) This is the last series of King Victor Emmanuel II and it starts in 1863 and ends in 1877...SG tell's us that the first stamps of this series - issued until 1865 - were printed by De La Rue, London and the last ones were printed in Turin...Another interesting aspect in this series is that all 'Royal Head' stamps have different frame corners.. I have to talk about one more detail that is the fact of the oval shaped Center could have solid Color frame or white frame (both with labels , of course..) .. in this small display we have only solid color Frames.. the chronology of this series goes like this..
the other stamps are from the first King Humbert I series... this series differ from the one's that come next , in the value that in this case is all stated in a written form... there are no numeric labels for the value...again , all the frame corners are different ; there are two stamps of 5c presented with the Green and Pale Green varieties.. I have also some color varieties of the 10c and 20c stamps , but I decided not to present them , because they are really not in conditions to be presented... 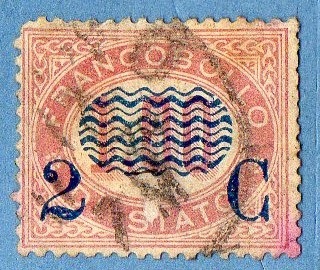 I don't have the 30c to show You because it is not a common stamp , according to it's cv (£ 2250.00 Used)..
the lower values of this series from 1891/1897 (1,2 and 5c) have the design of a Coat of Arms (the Arms of Savoy).. the rest are 'King's' stamps... one variety of Pale red is presented (10c) and others from the 20c and 25c exist... there are also different shades of the two stamps of 5c...the diversity in the frame designs is again an important fact to have in attention..
Well , this was a short post with fewer stamps than usual, but I think that dividing these classic stamps in two posts was the right decision..